Nearly 10,000 workers are suing Chipotle for allegedly cheating them on their pay. Current and former Chipotle (CMG) employees claim that the company made them work extra hours "off the clock" without paying them. It's a practice known as wage theft, and Chipotle is allegedly doing it all over the United States. "Chipotle routinely requires hourly-paid restaurant employees to punch out, and then continue working until they are given permission to leave," according to the class action lawsuit known as Turner v. Chipotle. It's named after a former Chipotle manager in Colorado, Leah Turner, who claims she had to work without pay and was told to make workers under her do the same in order to meet budget goals. Briana Alexander is one of the nearly 10,000 workers who have joined the lawsuit. She worked at a Chipotle in Miami, Florida for about a year, starting in the fall of 2013. "Behind the scenes, [Chipotle] is not always what it seems," Alexander told CNNMoney. "I can say I have worked off the clock." Alexander says she was forced to stay late numerous times at her store. If the workers weren't done by midnight or 12:30am, they were clocked out but told to keep working until the job was finished, even though they were no longer getting paid. Alexander also claims she worked 12-hour shifts on some days, but was clocked out after her shift time ended even though she actually continued to work on busy days. Chipotle has faced similar lawsuits before, but this is the first time there has been such a large class action case against the company for wage theft. As of Friday, 9,961 current and former workers have sent in consent forms to join the lawsuit. They come from about every state that Chipotle operates in, according to lawyer Kent Williams of Williams Law Firm, who is representing the employees in Turner v. Chipotle. 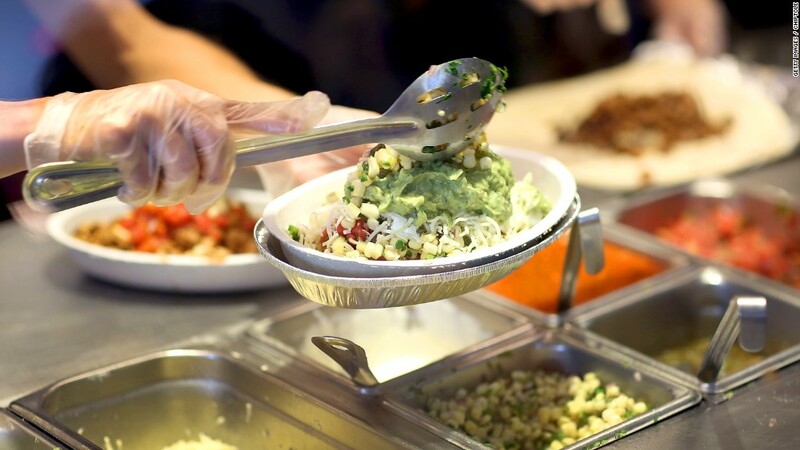 "Chipotle has argued this is a few rogue managers who aren't following policy. Our view, especially given the number of people opting in, is that it's a systematic problem at Chipotle," says Williams. Felipe Ricardo believes Chipotle continues to skimp employees on wages. He worked at a Chipotle in Danbury, Connecticut in the summer of 2016. "I only worked nights because I have a full-time job during the day," Ricardo told CNNMoney. "Normally the schedule says you end at 11:30pm, but it's almost impossible to get out at 11:30pm." He remembers working until 1 am one time. He told the manager to make sure his hours were adjusted to reflect the extra time. He recalls her saying, "Don't worry about it." But when he got his paycheck, the hours weren't adjusted. He complained, and isn't sure if the hours were ever changed. Working two jobs didn't leave him with a lot of time to scrutinize his hours, he says. Ricardo has not joined the lawsuit. The 23-year-old has since left Chipotle to go back to school. All hourly employees who worked at Chipotle from February 2012 onward were mailed a card in April asking if they wanted to join the class action case. Workers had to respond by July. CNNMoney has also heard from dozens of Chipotle workers who claim to have personally experienced wage theft at their restaurants or seen it happen to others. Some say they were not paid for five or more hours a week. The main complaints center around what happens at closing time. Workers are supposed to end their shifts between 11pm and midnight at many restaurants, but workers tell CNNMoney that they almost never leave on time. Chipotle's system automatically clocks workers out by 12:30am in most places, but workers say they are often asked to stay longer to finish cleaning and preparing for the next day. Managers are supposed to adjust the hours, but workers allege that doesn't always happen. Chipotle is trying to regain customers since an outbreak of foodborne illnesses (including E. coli and norovirus) made customers in several states sick last year. Customers have placed "an extraordinary level of trust in us and have come to know that we will do the right thing when it comes to our food, our employees and our approach to running a business," said Steve Ells, Chipotle's founder and CEO, on the company's earnings call in late July. Chipotle is expected to continue fighting the case.